Small and as full of energy as they are character, Jack Russell terriers possess intelligence and prey drive that allow them to serve in varied roles – from companion pet to tenacious hunter. The mostly white dog with brown and black markings comes in a trio of coat types – smooth, rough or broken-coated – and sizes, which leads to some confusion. 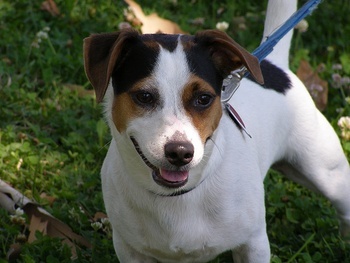 The standard Jack Russell remains much the same as the original breed that was established in the early 1800s. The Parson Russell terrier, closely related, is more of a conformation dog and has a more defined height of 12-14 inches at the withers (as compared to Jacks that range from 10-15 inches). Another closely related terrier, the Russell terrier or English Jack Russell terrier, is a smaller version, reaching only 8-12 inches in height. The Jack Russell terrier was originally bred to hunt foxes. Its job was to flush or corner the animal in its den, giving the hunter a chance to kill it. They were later adapted to hunt badger, which required the dog to possess the courage to square-off with a dangerous foe in the confined space of its burrow and tunnels. This tight-spaced hunting helped necessitate the shorter-legged varieties of the Russell terriers; a different form for a different function. Today the Jack Russell terrier still competes in earthwork tests/trials and retains, even among pet-quality animals, its high prey and energy drives. They make great companion animals, but owners need to give them proper exercise and challenge their minds – left alone, they will most likely get into trouble in an effort to relieve their boredom. Nipper, the inspiration for Francis Barraud’s painting His Master’s Voice, is believed by many to be a Jack Russell terrier. Other famous JRTs include: “Eddie” from the sitcom Frasier; Bothy, who made history in 1982 as part of the Transglobe Expedition, was the first (and likely last) dog to travel to both the north and south poles; “Wishbone,” from the television show of the same name was a JRT; Jack Russell: Dog Detective is a series of children's books by authors Darrell and Sally Odgers about a JRT and his friends; as well as several other Jack Russell terriers appearing in movies and televisions shows. With an average lifespan of 13 to 16 years, Jack Russell terriers are a relatively healthy and active dog. They are affected by some disorders and genetic mutations, mostly involving musculoskeletal and eye issues. At Paw Print Genetics, we offer a panel test for Jack Russell terriers that includes alopecia, hyperuricosuria, primary lens luxation and severe combined immunodeficiency disease. Additionally, we offer canine congenital hypothyroidism, which has been identified in the closely related breeds of the rat terrier and toy fox terrier, and mucopolysaccharidosis VII, which has been identified in Brazilian terriers. The energetic and entertaining Jack Russell terrier can do it all, from a ground-hunting animal that will pursue fox, badger and groundhogs to speedy agility-trial competitors to loving family pets.